For any bride, they want to look stunning on their wedding day. And no matter what – you will. But, most brides like to spend time getting themselves ready and picture perfect for their big day. And, quite often, in the whirlwind of wedding planning, they forget to do the prep, and end up trying to fit everything in to the last few days including the wedding day, and have to abandon plans they had early on. There are many things you can do in advance of the bog day that will help you to look and feel amazing, and by planning in advance, you don’t run the risk of forgetting things, or having to cut out plans. No matter what happens, your wedding will be perfect, and the person lucky enough to marry you will think you’re the most beautiful thing in the world regardless. But we all understand the want to look the best we can, and there is absolutely no shame in it. A lot of beauty prep you can do has little to do with makeup and stylists, so make a plan that you can stick to, but don’t get stressed out about it. Plus, there are beauty prep routines that will help you to stop stressing! Which is perfect for any bride. And we’re not talking about how you can lose five stone in three months – because that is just not going to happen. If you want to lose weight for your big day, then look at your diet and start cutting out the fats and sugars, make sure that you have the right portion sizes for you, and that you are eating all the right things. Get some advice if you’re unsure of the right diet for you. A balanced diet has so many more benefits than just losing weight – it will give you more energy, which is perfect for those long days trying on wedding dresses. It helps you sleep better, which counteracts those stressful nights. And it can also clear your skin. The biggest contributors to bad skin are greasy foods, dairy and sugar. Cut all these down or out, and combine it with a good skin care routine (which we’ll talk about later on) and you’ll see improvements in no time. 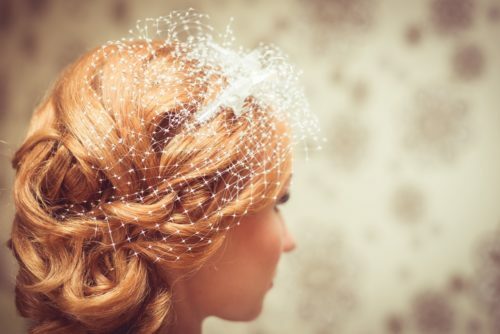 Prepping your hair for the big day goes beyond having it cut and styled just before the big day. Although, that is a big part of it. You can also help your hair to be as luscious and thick as those hair ads on TV. Use a deep cleansing conditioner once a month, and combine it with an argon oil and coconut oil wash. Use the right products for your hair type, and, if you have coloured hair then make sure you are using the right treatments for it; ie purple shampoo for fake blondes. You can also help your hair by drinking plenty of water, and applying a heat protector before applying any heat to your hair. Have dead and split ends trimmed regularly too. We have already touched on diet and exercise to help clear you skin, but, if you’re really concerned about it, you might also want to consider seeing a dermatologist for stubborn acne or blackheads. Apart from that, your skin can only improve with a daily skin care routine – which starts with drinking plenty of water. When buying products, make sure that they are right for your skin type – the three main types are oily, dry and combination skin. Use a cleanser and a toner day and night, with a foam wash on the mornin and an exfoliating wash in the evening. Use a face moisturizer every morning and night – you can switch to an anti-aging cream if you want to. Sunscreen should be used every day and not just when it’s sunny outside, and your skin can be protected from getting clogged with makeup by using a primer and water-based foundation. Add in a mask or a pour strip once a month for extra care. So many brides don’t think their teeth are up to scratch for their wedding photos. Everyone wants to have perfect photos on the big day, so if this is a problem area for you, then take this opportunity to fix it. Use a whitening toothpaste twice a day while also flossing to help improve the health or your teeth and gums. If you wish to make bigger changes to your smile, then go to a dentist for teeth whitening and any other procedures. Too many brides get so stressed over every little detail of the wedding, which causes sleeplessness, weight loss or weight gain, irritability, and simple unenjoyment of the whole process – which is a time we’re sure you’ll want to remember. One of the simplest ways of relieving some of that stress comes with meditation. It can simply be some time spent on your own, relaxing and doing nothing. Put on some calming music, light your favourite candles, and lay down. Focus on your breathing and visualise those stresses leaving you with every exhale. It’s a simple yet effective practice that you can use for the rest of your life.